Description: Artisan Gelato made with all natural ingredients sourced locally and around the world, handcrafted in small batches with love and passion to be enjoyed fresh! Inside Paul's Chocolates is Nucci's Gelato. A friend and I went yesterday. We are both back from Europe and thought we would like to try. We both had samples and I got the very dark chocolate (no dairy) and she got the Stracciatella. Both were delicious and they have enormous portions and overfill even a small cup. We should have asked if we could do two flavors in one cup each. Next time. Will also try the Paul's Chocolates in the cooler months. Excellent gelato, easy to find. We stumbled upon Nucci's and so glad that we found this gem! The gelato is so good! The staff is always wonderful at educating us when we have questions. 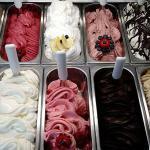 They will happily give you samples so that you can try the unique and traditional gelato flavors. Nucci's also has candy and other sweets available, but we never get past the gelato! So good!! I brought my teenagers here to have a birthday treat after dinner. The gelato was wonderful. Great flavors, smooth and rich. My husband and I indulged in a couple of chocolates and they were lovely. Service was very good and the staff member was friendly. Highly recommended. Wanted a snack to take the place of lunch! Hunting for ice cream and stumbled on gelato. The shop has very interesting flavors. It was good and the prices were reasonable. We wanted ice cream and found gelato instead which was better. We had a chocolate with hazelnut and strawberry and they felt delicious and very natural. We will return and highly recommend it. Prices are highly reasonable! Been to Nucci's Gelato? Share your experiences!